In this second decade of the twenty first century, the word “manager “has outgrown its literal meaning. Today a manager wears more than one hat, he is not just a leader or a delegator he is a corporate entrepreneur, a salesman, an analyst, a designer, a planner and so much more. And it is this spirit of the 21st century manager that generic over the counter we put to test in the ‘Best Manager’ event held during the annual fest of IFIM Business School, NAMAN ’15. We at IFIM believe that a manager should be a global citizen. And thus to achieve our objective an innovative game was designed for the participants. All the participants were given a map of the world with 21 countries marked on them, if woman takes cialis with the simple objective of travelling to as many countries as possible, within a set time and a fixed amount of cash. cialis bph trials Each traveller moved on from one country to another using different means of transportation, only if he answered the question pertaining to the country he intends to visit. The participant thoroughly enjoyed the business game which was christened as “The World is flat”. If mental stress was the by name for the first round then physical stress was for the second. The participants were asked to move around electronic city in search of answers to some of the questions given to them. With each answer being the name of a company in the vicinity of IFIM. The best manager event was christened as Blitzkrieg in accordance to the theme for NAMAN ’15. A bonus round was designed, using the letters of the word BLITZKRIEG. A set of questions were distributed among the participants, the answers to these questions were associated with the names of few IFIM students. The objective of the game was to answer these questions and hunt down these students whose names were associated with the answers. A manager today, needs to be an excellent communicator but more so he also needs to be an excellent problem solver; we intended to test in the next round known as “The Alchemist”. The participants were given a hypothetical problem. The solution to which needed to be presented to a panel of experts, consisting of Prof. M.H Sharieff, Dr. Srividya Raghavan and Prof Rupesh Kr.Sinha. Very few participants were able to bear the crucible of ethics, logic and pragmatism set by these experts. And the five survivors who cleared this crucible went on to become thefinalists for the final day of NAMAN ’15. In the final leg of Blitzkrieg, the finalists were asked to choose a core competency from three different companies. And create a product which addressed a social issue. This round tested the entrepreneurial drive of our young and energetic participants. The participants were tested for their sheer drive to solve a social evil but more than anything else to create a product which would earn them monetary gains. The panel consisting of Dr. Madhumita Chatterji (Director IFIM and Professor-HRM, CSR & Sustainability), Prof.Chowdari Prasad (Dean –Academics) and Prof. Rajarshi Chakraborty (Assistant Professor-PEP) caught on all the Freudian slips by the participants. The finale had all the ingredients of a complete entertainment. The audience loved the presentations but more than that that they loved the questions asked by the panellists. After the final round when everything was being wound up for the day, and the participants were taking a sigh of relief, it is then they had to face the stress interview. A tête-à-tête with the Devil’s Advocate, our very own Prof Rajarshi Chakraborty. What followed was a treat to the senses, the tension and the stress filled the room, while the audience were enjoying the show the participants tried in vain to outrun the tornado of questions that hit them. 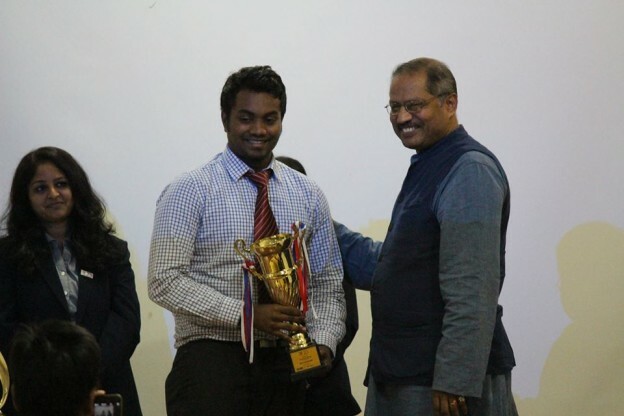 In the end when the dust settled we had got our shining star for the day, the best manager for NAMAN ’15, Sai Swaroop from CMS Business School, Bangalore. Who so ever said “ No Pain, No Gain” would find our participants agreeing with them. As we had said earlier, that in the 21st century a manager has to wear many hats, the support team of Blitzkrieg without whom this event was hard to imagine, made sure that the participants did justice to the different hats they wore. This entry was posted in Events & Happenings, Life @ IFIM, Memorable Moments on September 21, 2015 by Publisher.